It’s not often we get to write about a bookmaker which was founded all the way back in the 1930’s… but that you still probably haven’t heard of. Well, today we get the chance to, in the form of Toals! Toals are not a “small” bookmaker, by any means. In addition to their impressive history, they operate more than 50 physical betting outlets. The reason you might not have heard of them, however, is that they operate exclusively in Northern Ireland. If you’re a UK resident then you can still certainly sign up with Toals. The real question, of course, is should you sign up with them? That’s exactly what we’re going to find out in this Toals review. The initial free bet qualifying period is the first seven days from which a player registers an account. This offer is limited to one free bet award per person/per household/per day. Valid for new customers only. 18+. Very Large Starting Bonus – But Hard to Claim. The Toals new customer offer is certainly eye-catching. It offers “Up to £250” in free bets, after all. The problem is that you only get those free bets by jumping through a whole lot of hoops. You need to place five wagers of £5 or more within your first week to get an initial £10 Toals free bet. After that, to access the supposed £240 that remains, you’ll need to place a whopping 10 bets of at least £5 each week. Only then will you continue to receive £5 free bets. In fairness, you don’t need to do this every single week to keep the offer going. Even if you miss a week, you’ll still be able to get your free bet the next week. Really, this is a classic case of an offer sounding more appealing than it really is. There might be “£250” in free bets available… but it’s highly unlikely many people will actually receive that amount. If you’re not interested in the long term aspect, you could treat this as a classic one-off sign up offer. Even then, though, you’d need to bet £25 just to get a £10 free bet. Given that most similar offers are “Bet £10, Get £30” or similar, this obviously isn’t very appealing. Overall, the Toals sign up offer leaves a lot to be desired. So, Toals’ welcome offer certainly isn’t anything to write home about. Can their ongoing promotions help to right the ship? The answer is… sort of. The ongoing Toals promotions aren’t exactly going to set the world on fire, but they’re certainly solid. There are seven sports promotions on offer right now, which are mostly ongoing deals, with a single one-off promotion thrown in. The only football-related offer is Acca Insurance, which you’ll find at most bookies nowadays. In this case, if one leg of your five-plus selection acca fails, you’ll be reimbursed for up to £25 of your stake. Toals actually also offer the same Acca Insurance deal across all sports, which is certainly more unusual. Elsewhere, there are Guaranteed Odds deals for both horse and greyhound racing, which give you the final price before the race, even if it’s better than the one you originally wagered on. The one-off Toals offer relates to the Fury vs Wilder heavyweight boxing clash, which is imminent at the time of writing. This isn’t especially exciting either, though. You can get a refund on a failed Named Round single bet, but only if both fighters end up getting knocked down. These ongoing promotions are okay, but that’s all they are. On their own, they’re certainly not going to draw in crowds of punters for Toals. Given that you might not have heard of this bookie before, the question “Is Toals legit?” is certainly a reasonable one. Given their sheer historical record, the answer is certainly “yes”… but we’re guessing you’d like a little more detail than that! Most bookies are reluctant to discuss their security measures in detail. Toals take this to another level, though. They provide absolutely no information whatsoever about their security, anywhere on their website. We have to say that this isn’t a good look. Toals are fully licensed and regulated by the Gambling Commission, which means they will have passed some stringent security checks. This, coupled with their long-standing reputation, should be enough to put you at ease. The complete absence of details on their security is frankly bizarre, though. Regarding the beautiful game, Toals got off to a bad start in this review with their single, unimaginative football-related promotion. Have they managed to overcome this deficit with a strong football section in general? Generally speaking, the answer is yes. Their football features are solid rather than exciting or innovative… but that still represents a big improvement on their promotions! The layout of the section is okay, but it’s not up there with those of the biggest and best bookies. The vast majority of the screen is taken up by Featured Matches – the biggest games of the day, across a variety of major competitions. This helps you to locate the matches you’re most likely to be betting on nice and quickly. You use a side menu to find the rest of the main markets, which is strangely located on the right-side of the screen rather than the left, where you’d normally expect to find it. Regardless, this is where you’ll find the other most popular bets – Both Teams to Score, Double Chance, and so on. Regarding actual features, there’s not a huge amount to report. In-play betting does work smoothly, as does cashing out your live bets. 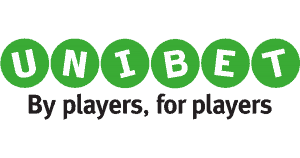 There’s no live streaming of matches, however, which is something that the bigger bookies – like Bet365 and William Hill – include as standard nowadays. Again, this is a solid offering, but it isn’t the most impressive football section you’ll find. 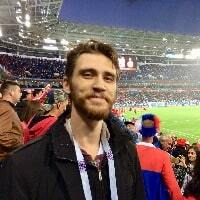 Toals does a good job of going beyond football, and providing for fans of the wider world of sports betting. Regarding other betting markets, horse racing is probably the most ably represented. Alongside the respectable aforementioned promotions, there’s also an excellent range of live betting opportunities, and the chance to bet on virtual races too, if you so desire. That aside, you’ll find all your usual markets present and correct here – boxing, cricket, golf, rugby, and so on – with in-play betting available for those too. As you might expect from a proud Irish bookie, Gaelic football and hurling are also well covered. At several points during our research for this review, we got the feeling that Toals was a little behind the times. Fortunately, this is not the case with their app. The Toals mobile app isn’t the most feature-packed on the market, but it’s a fine effort nonetheless. The interface, in particular, is outstanding. Much like the desktop counterpart, it’s intuitive to navigate for both newcomers and long-term users alike. The design looks great too, mixing a cool, dark-blue background with clear black text. This makes everything extremely easy to discern, even on a smaller screen. In terms of its features, the Toals app – again like the desktop version – is found wanting. 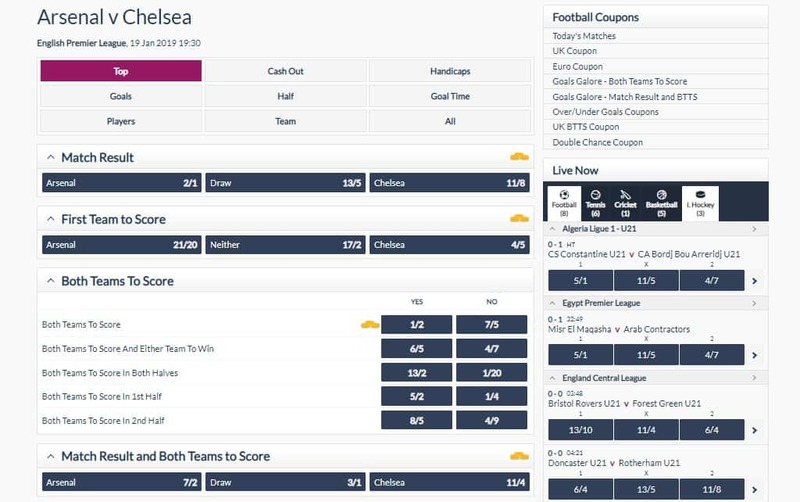 Whilst both the in-play betting and Toals cash out option work smoothly, there’s the same lack of promotions, and there are no streaming options. Touch ID is available for logging in, though, which is a nice touch. The truly bad news is that this app is only available for iOS users. That’s right – there’s no Toals Android app. Considering Toals’ size and stature, that’s a very disappointing omission. Instead, Android users will be forced to use the mobile version of the site. Whilst that also works smoothly, and seemed reliable during our testing, the interface is slightly more finicky to use than the actual, dedicated iOS Toals app. We can’t fully endorse Toals’ mobile offering, because of the surprising lack of support for Android users. What is in place, however, is very good indeed. The Toals sign up process is slightly longer than most, but it’s still pretty speedy. At the first phase, you enter all of your basic details. These include both personal information – name, date of birth, etc. – and the password for your account. On the next screen, in a slightly unusual step, you must enter your billing address. Finally, you’re also required to enter your payment details straight away. 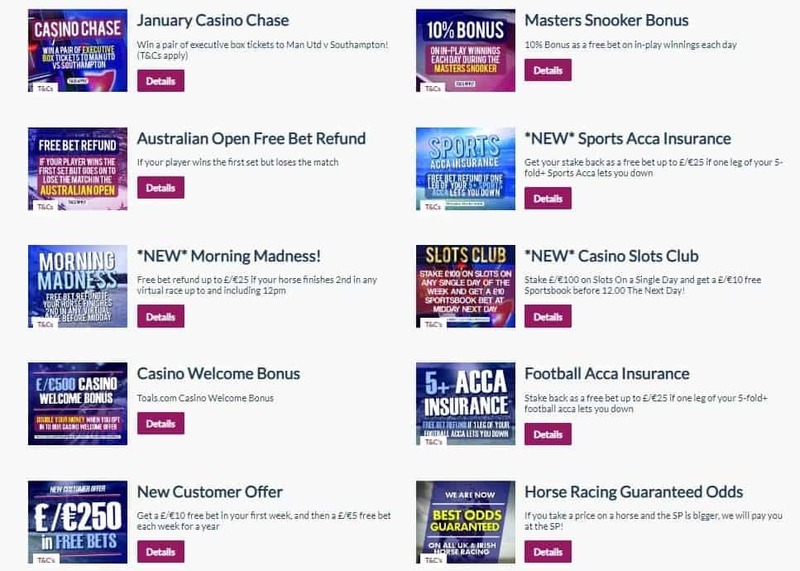 Again, this is slightly unusual – most bookies allow you onto the site first, and let you make a deposit whenever you like – but it’s not a major issue. Once you’ve completed those three steps, you’ll be all set to bet on Toals. Welcome to another area in which Toals disappoint! Any modern bookie worth their salt should offer a decent range of payment methods. Toals offer just one – credit card. Visa, Visa Electron, Mastercard and Maestro are literally the only tools you can use to deposit into your account. Services like Neteller, Skrill, and even PayPal are absent, and there’s no option to make a bank transfer either. Confusingly, in their T’s & C’s, Toals state that they accept deposits “via the following eWallets: Neteller and Skrill”. When we actually went to the deposit screen, however, we were only given credit cards as an option. The minimum deposit amount is £10, and deposits are processed instantly. Toals withdrawals must also be at least £10, and they will be returned to whichever payment method you’ve registered on your account (you’re only allowed one at a time). It should go without saying that having quality customer support is vital for every single bookie. Apparently this bookie didn’t get the memo, though, because Toals’ customer service offering is truly shocking! There is literally only one way to contact Toals – by using a single email address. There is no live chat feature, and no phone number to call. Basically, there’s no way to get an immediate response, if your enquiry is urgent. In this day and age, that’s poor to say the least. In this case, you’d obviously expect Toals to have invested in a wide-ranging, high quality FAQ section. That would make up for the lack of direct contact options, right? Well, you won’t find that here either! There is literally no FAQ section whatsoever. We can’t think of a single other major bookie which didn’t bother to include an FAQ on their website. Oh dear. Toals’ customer service is simply light years behind that of its competitors. Whilst it’s fair to say that Toals haven’t broken into the betting mainstream across the UK, they’re actually one of the most historic bookies on the scene. They were formed back in 1932, in the town of Ballymena, and have actually remained a family-run business ever since. This obviously stands in stark contrast to many of the big bookies who’ve merged, been bought out, or have otherwise changed hands over the years. Toals have made efforts to modernise their online offering in recent years, but they remain committed to more traditional betting shops too. They are continuing to add outlets to their collection, and in 2015 they actually opened the biggest betting shop in the UK and Ireland, located in Belfast. Toals themselves are also based in Belfast, and are fully licensed by the Gambling Commission. If you’re looking for a new bookie, Toals aren’t a bad choice by any means. There are much better options out there, though. In general, it simply feels like Toals are stuck behind the times; like they’re happy to keep focusing on their physical stores, rather than their online operations. Their offering lacks some features that we’ve simply come to expect from big bookies now, like live streaming. The enticing welcome offers and ongoing promotions which most bookmakers have as standard are also absent. Their mobile app is available for iOS, but not for Android. Most notably of all, the customer service – or lack thereof – lags massively behind that of Toals’ competitors. It’s not all bad news, of course. The football section is solid enough, the app which is available is good, and the interface is well thought-out and easy to navigate. Again, though, unfortunately we must state that there’s very little reason to choose Toals over any other bookie right now. That said, there’s still no real reason not to sign up, take advantage of their new customer offer, and at least give them a shot.